I want to be very clear that this is an estimation of pull rates based on the contents of 100 Gold Plus packs. These are NOT official rates from EA Sports. I thought it would be interesting to track everything I pulled from 100 Gold Plus packs and start a discussion of pull rates based on the data. Before we get to the pull rates, I just want to explain how I calculated them. It is per card and not per pack. For example, I pulled seven 91 OVR players – out of 100 packs. The per-pack pull rate would be 7%; however, there are 3 Gold Rare players per-pack, so I had 300 opportunities to pull a 91 OVR player. The per-card rate for pulling a 91 OVR is 2% based on the 100 packs I opened. Per-card rate makes it more relevant to all the other packs you may open, especially for the player card type. *You will get a combination of collectibles, logos, jerseys, coaches, arenas, and HUT Tips. The combo will always add up to 5, but it could be 3 collectibles and 2 logos or 1 arena 2 HUT Tips and 2 Jerseys, etc. For the calculation, I’ll assume all 5 give a chance at any of the above even though it does appear there is a maximum cap for some. Example, I never received more than 2 HUT Tips in one pack. Finally, the interesting stuff! All the pull rates divided up by card type. Here are all the 90+ OVR pulls. The previous data was based per card as explained earlier; however, collectibles make sense to do on a per pack basis since we don’t really know how many chances we have at them per pack. It’s also worth mentioning that daily/weekly set collectibles(Evolution, Milestone, TOTW, etc.) are only available in regular packs unless a limited time pack specifies otherwise. Below is the full data from every pack that I opened and it is organized per pack. This is similar to the sheet I used to keep track of everything as I opened them. It will probably look a bit messy since there are so many columns but felt I should include it. Hope you found something interesting here! I may do it again later when Ice cards aren’t in packs anymore to compare. The cards available in packs can impact pull rates quite a bit. It looks like I pulled a lot of great cards but most of the Ice cards didn’t have much value and have even less now. By the way, if you’re curious how much I earned from all the quick sells… 267,230 coins. I quick sold everything except most of the 89+ players, few base cards that had decent value at the time, and collectibles. 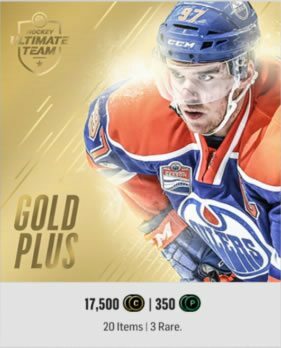 The Complete NHL 19 HUT Evolution Guide!